Former Planning Board Member and Montgomery Women President Meredith Wellington has filed to run for the Democratic nomination for the open council seat in District 1. 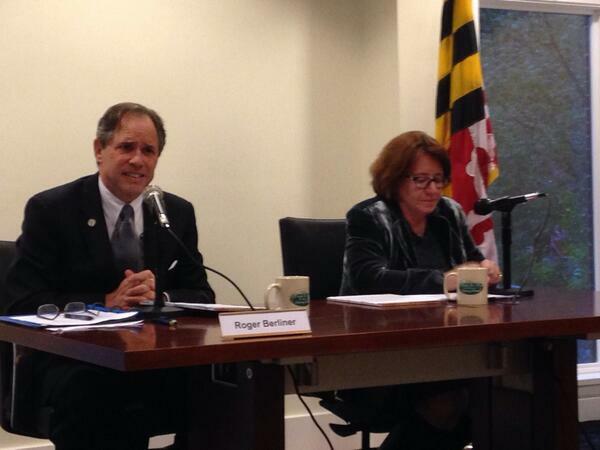 Last night, District 1 Candidates Duchy Trachtenberg and Roger Berliner debate in the Town Hall of the Town of Chevy Chase. I live tweeted the debate, so can follow the blow-by-blow there. Overall, it was “disappointingly cordial” in the eye of one observer looking for more heat and light and less combative than the debates in District 5 according to reports. Best Moment: When asked about the event that changed their life the most, Duchy spoke about her son’s mental illness and how it led to her involvement in NAMI. It was honest, authentic, and the one moment when there was a moment of real connection. Honest Moment: Duchy called the race a “battle royale” between the government employee and school system unions. It’s one of those truths that is increasingly obvious but that few want to say out loud. No doubt others will label it a gaffe for exactly this reason but the straightforward honesty was refreshing. Missed Opportunity: Roger attacked Duchy’s support for the restoration of effects bargaining despite the decision by the voters repeatedly and effectively. Duchy could have countered effectively with Roger’s willingness to overturn the referendum on ambulance fees. Instead, she went with unconvincing speculation that the resulting decline in police morale has caused crime to rise. Roger’s Strengths: He managed to disagree with Duchy while appearing calm and civil yet still setting himself apart crisply from her on certain key issues, such as effects bargaining. Roger was also good at simultaneously calling for working for common ground but also standing up for the public interest, as in Ten Mile Creek. His final words about fighting special interests trying to oust him were among his best in the debate. Duchy’s Strengths: Conversely, Duchy managed to attack calmly without appearing too disagreeable–a very difficult line to walk, especially for a challenger who simply has to differentiate herself from the incumbent in order to convince voters to fire him. She came across well. Roger’s Weaknesses: Was it smart to repeatedly attack Maintenance of Effort? Voters have no idea what you’re talking about but it sure tees off MCEA. That endorsement is still out there and one would think it’s Roger’s to lose, especially after Duchy characterized the budget as a tradeoff between schools and the rest of the budget in a way that should make MCEA worry. Duchy’s Weaknesses: She just refused to take a real position and called for bringing people together on way too many issues (and more often than Roger). You can do that on some issues but not every issue. The tactic of handing out a list of her and Roger’s contributions from developers offended some and was unconvincing as the last reporting period was in January. In Attendance: Nice to finally meet Brian Kildee and Liz Matory after the debate. Also in attendance: George Leventhal, Almina Khorikiwala, Pat Burda, Linna Barnes, Pat Baptiste, Cindy Gibson, Jon Gerson, Andy Harney, Jonathan Sachs and many others. And last, but not least, thanks to Charles Duffy for moderating. Great to see so many come out despite the torrential rains. Note: I’m supporting Roger but have tried to call it as I see it. This is Part II in a two part series about District 1 in Western Maryland. While Part I focused on the Garrett County portion of the district, this post centers on Allegany County. All of District 1B’s population lives in Allegany. 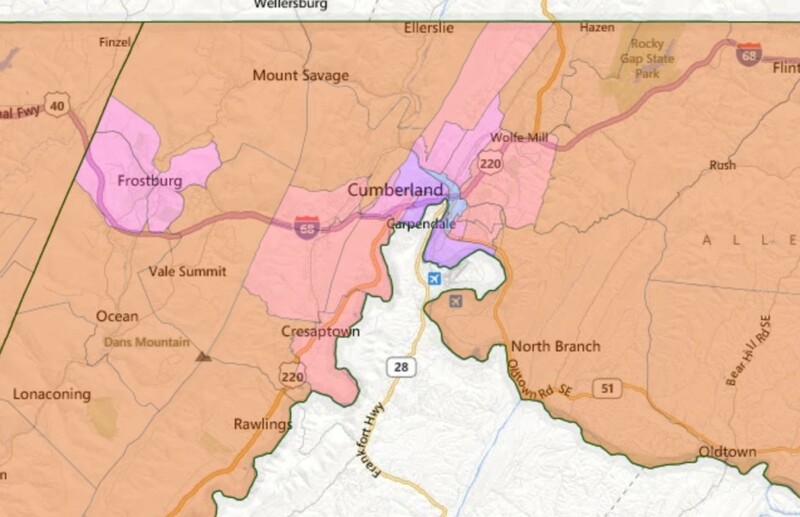 Frostburg and a northern section of Cumberland are located in 1B. District 1C is split between Allegany and Washington Counties with 55% in Allegany. The remainder of Cumberland and all of the smaller town of Hancock in Washington County are located in 1C. Allegany County has been heavily Republican in federal contests. Mitt Romney received 64% of the vote in 2012. Rep. Roscoe Bartlett received 55% of the vote in Allegany even as he went down to defeat to John Delaney with just 37% of the total vote in the entire Sixth Congressional District. Lately, Allegany has also been quite lopsided in its support for Republicans in statewide contests. Bob Ehrlich won 57% in 2006 and 61% in 2010 in Allegany. Notice that Ehrlich increased his share of the vote in Allegany even as his statewide margin declined. The last Democratic gubernatorial candidate to carry Allegany was Parris Glendening in 1998 with 52% of the vote. Allegany District 1B has been one of the most hotly contested delegate seats over the past several decades. Incumbent Democratic Del. Kevin Kelly won reelection in 2010 with just 51% over Republican Mary Beth Pirolozzi, a Cumberland City Councilmember. Kelly originally won his seat in 1986 when he was one of two Democrats elected from a two-member district located entirely in Allegany. He easily won reelection in 1990. In 1994, Kelly lost the Democratic primary in the newly redistricted single-member District 1B, receiving 43% as opposed to 57% for Del. Betty Workman, his colleague in the former two-member district. But Kelly turned the tables in 1998, winning the primary over Workman by 59% to 41% and then went on to win the general with just 51% of the vote. Kelly beat his Republican opponent with a more comfortable 56% of the vote in 2002 and 2006. This year, Kelly has no primary opposition but faces Jason Buckel, a member of the Allegany County Republican Central Committee, in the general election. In January, Buckel had just $2.6K in his campaign account compared to $18K for Kelly, though Buckel could raise money during the session while Kelly could not. Though Kelly has a long history in this district, no Democrat can ever take anything for granted. Despite its Republican lean, 1B contains some of the less Republican precincts in Allegany located in Frostburg and Cumberland (see above), which should aid Kelly. District 1C is perhaps best known as the district that unseated the sitting Speaker of the House in 2002. Democratic Speaker Cas Taylor, who brought enormous amounts of state funds home and worked relentlessly to aid Western Maryland’s economy, lost his reelection bid by 76 votes. Redistricting was more the culprit than the fickleness of Allegany voters. Prior to 2002, 1C was contained entirely within Allegany County. District 1 grew more slowly than the the State as a whole in the 1990s and had to expand east, so 1C had to take in sections of Washington County. While Speaker Taylor won 61% in his home stomping ground of Allegany, he garnered just 29% in the new, extremely Republican Washington portion of the district. Del. LeRoy Myers, who defeated Speaker Taylor, is retiring after three terms. Two Republicans, Ray Givens and Mike McKay, are competing for the GOP nomination, while Democrat Nick Scarpelli has no opposition within his party. Swept in as part of the tea party wave in 2010, Mike McKay serves as President of the Allegany County Board of Commissioners. He’s the CEO of a company with six dry cleaning locations. McKay has the support of sitting Del. Myers. Perhaps because actually having to run a government tends to moderate extreme views on all sides, McKay is now being tea-party challenged from the right by Givens. A Hancock resident, Givens has never held office but was very active in opposition to Gov. O’Malley’s gun safety legislation and supports fracking. Givens has served in the military, and worked in corrections and law enforcement. In January, McKay reported $15K cash on hand as compared to $10K for Givens. As McKay lives in Allegany and Givens is from Washington, this primary could well turn into a classic friends-and-neighbors contest that depends on the level of support and ability to turn out voters within each candidate’s home base. Del. McKay should benefit from his experience in office as well as his endorsement by Myers. But Givens could gain energy from gun rights advocates. Meanwhile, as unlikely as it may sound, Republican 1C is one district where the Democrats hope to make a pick up. Cumberland City Councilman Nick Scarpelli is a local magnate with investments in chains of funeral homes and shoe stores as well as real estate. Scarpelli is very conservative for a Democrat–he is pro-gun, pro-life and pro-fracking. His major goal is to join the majority caucus and be part of the fine tradition of bringing home the bacon to this long economically challenged region. Scarpelli can self fund and plans to advertise on television–a lot cheaper in the Hagerstown media market than elsewhere in Maryland. His chances likely depend at least partly on who wins the GOP primary. Scarpelli would have a stronger shot against Givens than McKay. Regardless, he will make this a much more interesting race than one would expect in this mostly Republican part of the world. District 1B Rating: Toss-Up (Slight Edge to Kelly). District 1C Rating: Lean Republican (Slight Edge to McKay in the primary). 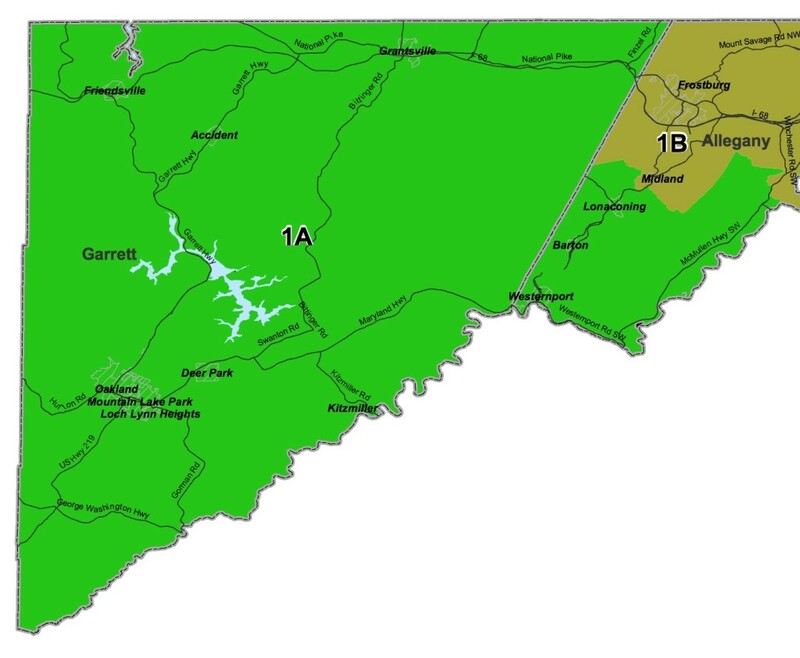 District 1 contains all of Garrett and Allegany Counties as well as the westernmost section of Washington County. It’s the most Appalachian section of the State and in many ways resembles West Virginia more closely than our suburban dominated state. The division of District 1 into three subdistricts helps assure that Garrett and Allegany can each elect at least one delegate. According to the 2010 Census, three-quarters of District 1A’s population lives in Garrett to just one-quarter in Allegany. Republican Sen. George Edwards, first elected in 2006, has an easy ride to reelection as he has no primary or general election opposition. Edwards has deep roots in Garrett County politics. He served six terms in the House representing Garrett County prior to his election to the Senate. Even earlier, he was on the Garrett Board of Commissioners and the Grantsville Town Council. Edwards’ electoral success means that no member of the Senate hails from Allegany even though it population is 2.5 times larger than that of Garrett. Though Garrett punches above its weight in General Assembly representation, the membership of its delegate and senator in the minority Republican Caucus limits their influence. Garrett is the second smallest and most Republican county in Maryland. Its Republicanism dates back to the Civil War and reflects the pro-Union sympathies of Appalachia. Mitt Romney won 74% of the vote, more than any other county in Maryland by nine points. Like Garrett, the Allegany sections of 1A are very Republican. Mitt Romney carried roughly 70% of the vote there. Former one-term Garrett County Commissioner Wendell Beitzel, a Republican, followed Edwards as District 1A’s representative in the House of Delegates. Though Beitzel won the GOP primary with just 31% and the general election by 56% in 2006, he faced no significant opposition in 2010. Like Edwards, Beitzel faces no opposition in the primary or general election this year. District 1 Rating: Edwards Unopposed. District 1A Rating: Beitzel Unopposed. 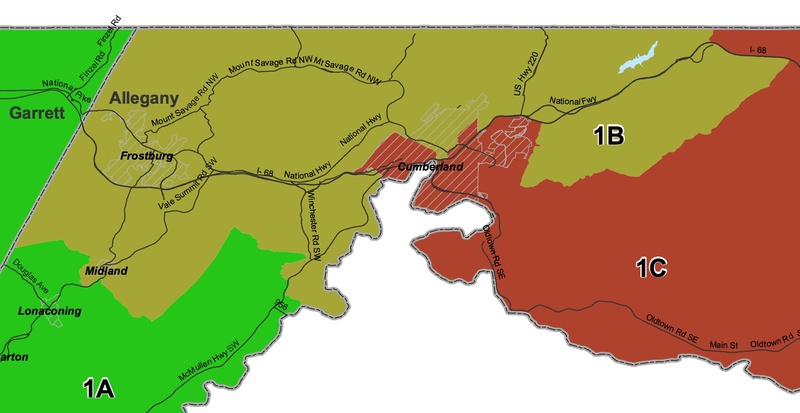 Part II discusses the rest of District 1, located primarily in Allegany County. Carroll County Commissioner Robin Frazier opened a meeting of the Commission with a prayer invoking Jesus Christ despite a federal court order. She views the order as a wrongly issued violation of her First Amendment rights. Interestingly, two of Frazier’s colleagues were not present based on the video. Frazier is “willing to go to jail” and said that America will soon be “all the way to Communism if we don’t start standing up and saying no.” She lumped the anti-prayer ruling with plots to take away guns, palm scan her children, and take away property rights through Plan Maryland. No wonder two of her colleagues skipped. Frazier represents Council District 1 along the Pennsylvania border. She served a previous term on the Commission prior to four years in the Ehrlich Administration. Remembering the time when Alabama Supreme Court Justice Roy Moore erected a surprise monument to the Ten Commandments, I couldn’t help but think she must be running for something. In Moore’s case, he ran for governor unsuccessfully at the next election after being removed from office. However, Wantz poses a serious threat. At the time of the January campaign finance filing, Wantz had $6100 in his campaign account compared to $3500 for Frazier. Moreover, she won the primary with only 41% in 2010, rather weak for someone who held the seat previously and with connections to a Republican governor. Wantz has been very active in Carroll County both fighting fires and in emergency ambulance services. Not a bad record for a prospective candidate. In contrast, Frazier tweets about the “Bathroom Bill” and Second Amendment rights. In comparison, Wantz seems less interested in grandstanding but actually focusing on Carroll County’s real issues based on his campaign video. A welcome approach from candidates of either party in any county in the State. 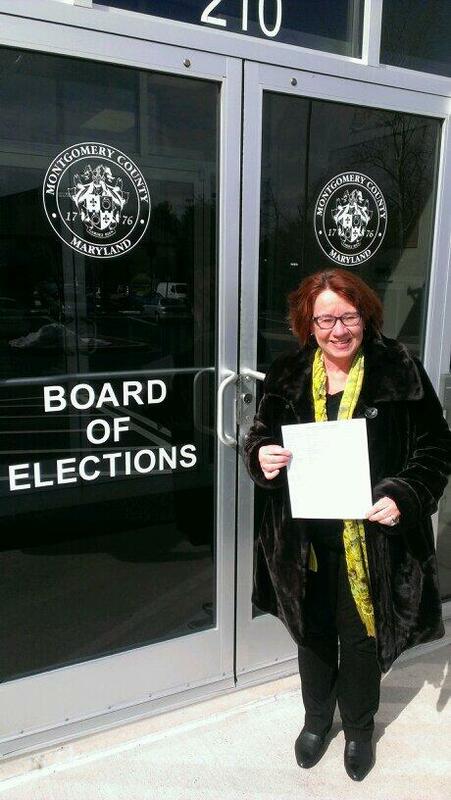 Former At-Large Councilmember Duchy Trachtenberg has now filed to run against incumbent Roger Berliner in the Democratic Primary for the Montgomery County District 1 seat, which ranges from Chevy Chase to Whites Ferry. Roger will be seeking his third term while Duchy will be seeking to return after losing reelection for an at-large seat four years ago. My previous post on Duchy here and great analysis by Adam Pagnucco of why she lost four years ago here. My immediate guess is this race will be ugly. Neither minds throwing a rhetorical punch or arguing their case. Duchy will probably try to paint herself as the true progressive woman as opposed to insider lawyer Berliner. Roger has $52K in his campaign kitty while Duchy has $123K. Both will raise more. Each has their set of fans but also have developed some enemies in the district. It will be interesting to see if any of Duchy’s former colleagues endorse her over Roger, their current colleague.